This Sunday I'm happy to share an awesome book of poetry I bought last year. I was simply shopping on the shelves and the cover popped out at me. Intrigued, I opened to find some of the funniest and insightful poems I've read. Made out of newspapers. I'm talking about Austin Kleon's Newspaper Blackout. 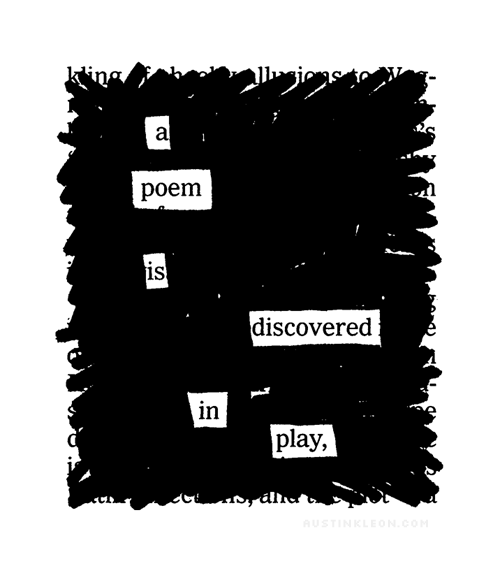 "Poet and cartoonist Austin Kleon has discovered a new way to read between the lines. Armed with a daily newspaper and a permanent marker, he constructs through deconstruction—eliminating the words he doesn't need to create a new art form: Newspaper Blackout poetry. Highly original, Kleon's verse ranges from provocative to lighthearted, and from moving to hysterically funny, and undoubtedly entertaining. The latest creations in a long history of "found art," Newspaper Blackout will challenge you to find new meaning in the familiar and inspiration from the mundane. 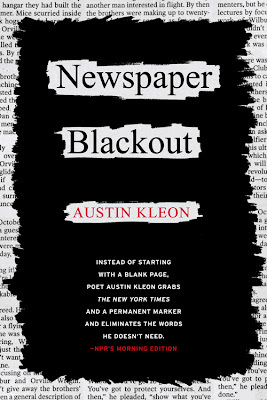 Newspaper Blackout contains original poems by Austin Kleon, as well as submissions from readers of Kleon's popular online blog and a handy appendix on how to create your own blackout poetry." It is a really, really cool book. I've done this on several occasions when I've been stuck for inspiration. I've also seen people do his with magazines and books. The point is to create something new, and that's why I love them.